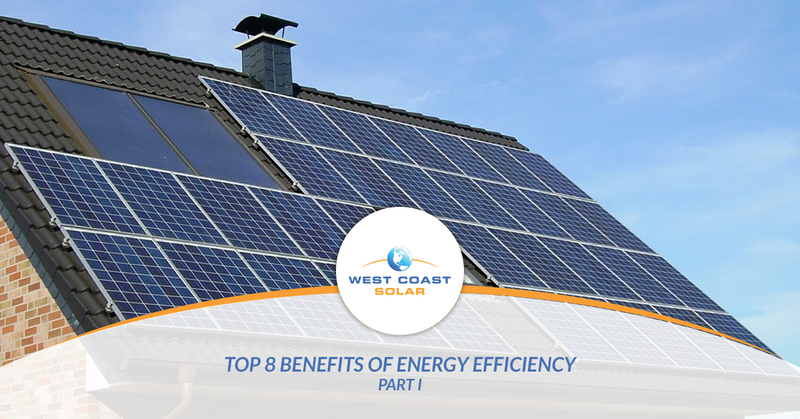 Our team at West Coast Solar is seeing more homeowners become energy conscious. We think it’s great! Homeowners are focused on using renewable energy, conserving energy, and becoming more efficient with their energy use. When it comes to their homes, it’s apparent they can do more. Replace appliances, address insulation issues, review energy use and more. Whether they want to switch to solar energy and install solar panels, or they simply want to update their house to be more efficient, West Coast Solar is all for it. In the following post, we’ll share eight benefits to energy efficiency in your home. It’s common to say you can save money on energy bills if you update your home to be more efficient with energy use. You can take steps to make this happen with energy efficient appliances, home upgrades, and more. A simple home energy audit can show you where you could save you between 5-30 percent on your utility bills annually. When homeowners consider new appliances, home upgrades, or even a solar energy system, they see the cost of the item and balk at the purchase. West Coast Solar wants to encourage you to see these purchases as investments for your future. Although the cost of the items mentioned above may be substantial, you will be doing more than saving money over the lifetime of the product. You will be helping save the environment, too. As your energy efficiency goes up, so will your savings, since you’ll be spending less on your energy bills. As an attractive feature to any home, energy-efficient homes and energy-efficient-certified homes have shown to sell for more than non-efficient homes in the same area across the real estate industry. Once again, investing in energy efficiency is a way to do more than save money. It adds value to your home, helps the environment, and creates a better future for you and your family. When you optimize your home’s energy use and update its efficiency, you will find your quality of life increase. For example, updating your insulation and air sealing can create warmer, drier air, which improves the relative humidity and air temperatures indoors. Add heating system, ventilation, vent dryers, and appliance upgrades, and you could see a decrease in moisture, which decreases the chance of mold, particulates, and allergens, and your utility bills. You can reduce utility bills, save money, and enhance your quality of life with simple home upgrades. At West Coast Solar, we support energy efficiency; it’s one more way to help the environment and create a better future for us all. Nonetheless, a solar panel system is a great addition to any home. It offers clean energy alongside all the home upgrades you’re making to save money on energy. If you want to learn four more ways to become energy efficient, read part two of this blog series. Otherwise, give us a call today, and let’s get started on your solar energy system!